Montréal, March 30, 2017- Yorbeau Resources Inc. (TSX: YRB.A) (the “Company” or “Yorbeau”) is pleased announces that it has filed on SEDAR a Technical Report in compliance with National Instrument NI-43-101 on a mineral resource estimate at the Company’s 100% owned Scott Lake Project near Chibougamau, Quebec. The mineral resource estimate was prepared by William E. Roscoe, Ph.D., P.Eng. and Katharine Masun, MSA, M.Sc., P.Geo. of Roscoe Postle Associates Inc. (“RPA”). Mineral Resources are estimated using a C$100/t net smelter return (NSR) cut-off value for massive sulphide zones and C$65/t NSR cut-off value for sulphide stringer lenses. Mineral Resources are estimated using a copper price of US$3.25/lb, a zinc price of US$1.20/lb, a gold price of US$1,500/oz, a silver price of US$22/oz, and an exchange rate of US$0.80 to C$1.00. It should be noted that compared to the mineral resource estimate reported in the February 14, 2017 press release the table above shows a small increase in resources as a result of further internal review by RPA. The Scott Project consists of a number of mineralized zones that have all the characteristics of volcanogenic massive sulphide (VMS) mineralization. See attached figure (corresponding to Figure 14-1 of the Report) for location of massive sulphide and stringer zones comprising the Scott Lake deposit. VMS-style mineralization at Scott Lake comprises distinct stratabound massive sulphide lenses located mainly along or close to rhyolite-andesite/basalt contacts. In addition to the massive sulphides, separate zones of VMS-style disseminated and stringer sulphides, which may or may not be connected with massive sulphide lenses, have been found over a strike length of at least two kilometres. RPA estimated Mineral Resources for the Scott Lake Project using drill hole data available as of February 10, 2017. The current Mineral Resource estimate is based on a potential underground mining scenario using a C$100/t NSR cut-off value for massive sulphide zones and C$65/t NSR cut-off value for sulphide stringer zones. The Yorbeau drilling programs carried out from 2015 to date have increased confidence in the continuity of the mineralization and have shown that there is potential for other discoveries. 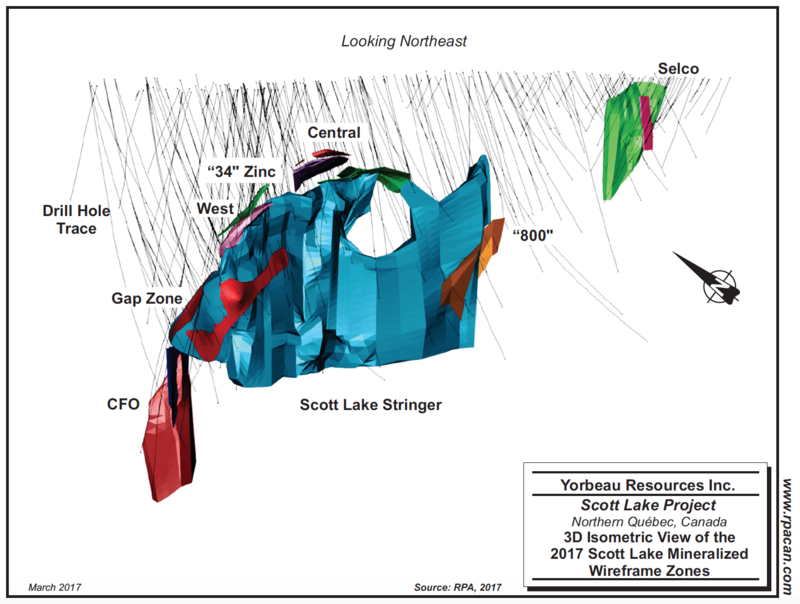 The discovery of the massive sulphide Gap Zone and the extension of the Scott Lake Stringer Sulphide Zone to the west are good examples, and have contributed most of the significant increase in tonnage in the current Mineral Resource estimate from the previous estimate completed by RPA in 2011. Continued exploration, primarily by diamond drilling, is abundantly warranted for the Property. A metallurgical test work program should be carried out using existing drill core representative of different zones of massive sulphides and stringer sulphides. A preliminary economic assessment (PEA) is warranted to guide further exploration and evaluation work. The Company has already initiated a metallurgical test on a representative composite sample and results are expected by the end of the second quarter of 2017. The Company is also evaluating a number of proposals to carry out a PEA. Work at Yorbeau is carried out under the supervision of Gérald Riverin, PhD, P. Geo. He is a qualified person (as defined by NI 43-101) and has reviewed and approved the content of this release. The Technical Report and Mineral Resource estimate referred to in this press were prepared by William Roscoe and Katherine Masun. Both are employees of RPA and are independent of Yorbeau. By virtue of their education and relevant experience, they are “Qualified Persons” for the purpose of National Instrument 43-101. William Roscoe and Katherine Masun have read and approved the contents of this press release as it pertains to the disclosed Mineral Resource estimate. The Company’s 100% controlled Rouyn Property contains four known gold deposits in the 6km-long Augmitto-Astoria corridor situated on the western half of the property. Two of the four deposits, Astoria and Augmitto, have substantial underground infrastructure and have been the subject of NI 43-101 technical reports that include resource estimates. The Company recently announced signing an Option Agreement with an affiliate of Kinross Gold Corporation to pursue exploration on the Rouyn Property (see press release dated October 25, 2016). In 2015, the Company expanded its exploration property portfolio by acquiring strategic base metal properties in prospective areas of the Abitibi Belt of Quebec and Ontario that also feature infrastructure favourable for mining development. The newly acquired base metal properties include Scott Lake which hosts important mineral resources.